Carnival to Resume Sailing From Baltimore Starting in March 2015. Carnival Pride to Return to Year Round Baltimore Cruises Starting March 2015. 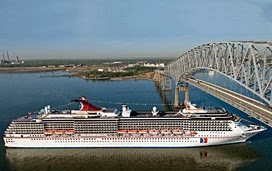 Carnival Cruise Lines and the Port of Baltimore announced that the cruise line will resume year-round departures from Baltimore when the 2,124-passenger Carnival Pride begins seven-day cruises in spring 2015. Norwegian Cruise Line's New Norwegian Getaway Sails to Bahamas. 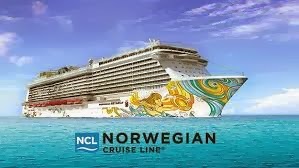 Amid a snow storm which dropped 7+ inches of snow on the New York Metropolitan area, the Norwegian Getaway left New York on a 2 -day, one way cruise to the Bahamas. Although I expected the Norwegian Getaway's departure to be delayed, awaiting the arrival of passengers, she actually sailed early. Scheduled to sail at 3:00 PM as published, the ship was on the move at 2:30 PM and already under the Verranzaro- Narrows Bridge and out in the ocean by 3:30 PM. This cruise is part of her repositioning cruise to Miami. The Norwegian Getaway is scheduled to arrive in Nassau on Wednesday at 7:00 PM and disembark her passengers that evening in Nassau. The ship will then sail empty to Miami to beging her inagural activities and commence her maiden Caribbean voyage. Due to the distance between New York and Nassau and the agressive arrival schedule, the Getaway needs to travel at near top speed. While departing New York, she was sailing down the Hudson River at 16 Knots (almost 19 Miles per hour). At midnight, she was just off the coast of Atlantic City, New Jersey traveling at 20 Knot ( 23 Miles per hour). The Norwegian Getaway will be christened in Miami on February 7th - Click Here for More info.